Nothing says comforting breakfast food like doughnuts and a cup of joe; often doughnuts are associated with western society. Our love hate relation ship with carbs and sugar (to which I am ever thankful for, for with out there would be no need for me) provide ample opportunity for those scrumptious, moist, & heavenly circular treats to infiltrate our culture. In this we are not alone, cultures the world over have deep fried pastries similar to our doughnuts: Gulab Jamun (India), Fritole (Italy), Bismark (Germany), Paczki (Poland), Awwamaat (Lebanon). It is strange how often you find culinary similarities amongst our fellow nations and even more strange in the case of doughnuts is the fact that most of these fried dough’s are spherical or circular. Some may call it a co inky dink, shared consciousness, or six degrees of separation; I would call it common sense. There is a philosopher and anthropologist by the name of Joseph Cambell who has spent his entire life studying and comparing the myths of the world, using the psyche of the individual he brings to light a unified conscious world, gaya if you will. In the interview “The Power Of The Myth” with Bill Moyers, Joseph goes into greater detail on his views and explains the significance of the circle in the cultures of the world. Check it out! We are all a part of the same species (homo sapiens) we like to separate ourselves from other people of the world because they are un known and alien to us but they, no, we all have consciousness and are capable of stringing together thoughts into an idea and of executing that idea. It is entirely possible that any one of our brilliant thoughts has already been thought by someone else on this planet and even scarier! they may have even formed an idea and executed it. Until we can change our perceptions to be able to accept these others not necessarily agree just accept that on a fundamental level they are no different than us we will never find piece. Just think if we share a taste for greasy spheres of sweet leavened dough (doughnuts) what else might we have in common. Any and all activities carried out within a society i.e. baking are done in regards to cultural norms that serve as guide lines. Forgive me for grasping at this metaphor but if doughnut is to culture as culture is to its members than can I conclude that the world may at long last reach a state of peace if doughnuts where present at every U.N. meeting and negotiation alike. Ok now that I have made the obscure comparison between donuts and human kind lets actually make the donuts. Heat the milk to a boil and cool it down in the freezer to around 45 degrees Celsius, once cool dissolve the yeast in the milk. Mix together the flour, sugar, and salt in a bowl and add the milk, knead until a smooth dough is formed, transfer it to a floured surface and add the softened butter and continue to knead until a smooth elastic dough is formed. Shape the dough into a ball and place it in a covered bowl to proof until doubled. Punch and give the dough one turn which means to literally punch the dough and fold the dough over once, there by releasing some of the co2. Cover the bowl with plastic wrap and refrigerate overnight, make sure that the bowl has lots of room for the dough to expand. The ice cream base is a less thick creme anglaise recipe, which is a stirred custard that is thickened by the coagulation of egg protein. Put half of your cream and all of your sugar into a sauce pan. Cut the vanilla bean in half and scrape the seeds out using the end of your knife, place the seeds and the pod into your pot. Bring the mixture just to a simmer ( you do not want to boil the mixture). Separate your eggs and temper the egg yolks into the cream return the pot to the heat and stir using a spatula being sure to scrape the bottom of the pot slowly (do not whisk it or you will form a frothy rather than smooth custard) cook the mixture until it thickens slightly and will coat the back of a spoon. Remove from the heat and add the other half of the cream, this will help to stop the cooking process, refrigerate it in a shallow container over night with the vanilla pod before turning it off. To make the pineapple chips pre heat the oven to 200 degrees Fahrenheit and skin a fresh pineapple and slice 10 1/4cm slices off, cut the core out of these slices. Put the pineapple chips on a baking sheet lined with parchment put them in the oven for half an hour and then turn the oven off and allow the chips to dry overnight. For the compote chop up the pineapple into small bite sized pieces and finely chop the fresh basil, sprinkle with a little coarse salt and toss them together and refrigerate overnight to allow the flavors to infuse. Scale the dough into 8, 60g pieces place one ball of the cocktail boccocini in the center of each doughnut and envelope the cheese into the centre of the doughnut; round each doughnut and place on to a fryer rack or a greased baking sheet. Put the baking sheet into a small garbage bag and tie it up so the bag is full of air, proof the doughnuts at room temp until doubled if you need to speed up the proofing place them in a slightly warmed oven or on a stove top near the oven vent. Heat the oil to 350 degrees Fahrenheit and hold it there until the donuts are proofed. Once the ice cream base has had time to sit allowing the flavors to concentrate and infuse with one another we can now turn it into ice cream. I will explain how to do so using an ice cream machine but if you do not have one you can find plans on the internet of how to make a simplified one. Place the ice cream base into the ice cream machine and turn it on and that’s all there is to it. It could take anywhere from ten minutes to forty five depending on the machine, turn the cream until it is thick and there is no remaining liquid it should have the viscosity of whipped cream and should form stiff peaks. The ice cream will still be to runny to scoop but you do not want to overturn it into butter, place the ice cream in the freezer for an hour or two and it will be ready to go. Zest 1 orange and 1 lemon and spread the zest out on a baking sheet, bake for 3-5 minutes until the zest is dried and crunchy. Mix this with 2 cups of granulated sugar and place aside for later. Once the oil is heated submerge the fry rack in the oil or if you do not have one carefully place the doughnut on a slotted metal spoon and submerge it into the oil. Use a metal sieve, or strainer to push the doughnuts into the oil and fully submerge them. Once the doughnuts are nice and evenly browned remove them from the oil let them drip dry for 30 seconds and then toss them with the citrus sugar. 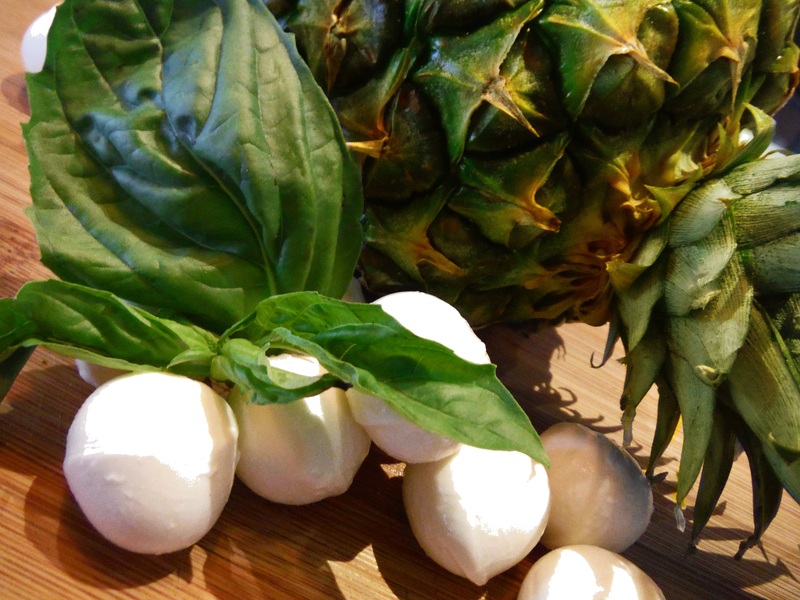 The doughnuts need to be served warm so that the bocconcini is nice and soft, serve them on top of a scoop of ice cream garnished with a basil leaf and a side of pineapple compote.